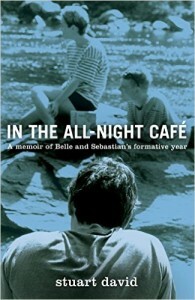 Thanks to the very generous people at Little, Brown Book and Mute we are able to offer a fantastic selection of goodies relating to the Stuard David book on the formative years of Belle & Sebastian (actually the blurb says Scottish indie sensation Belle & Sebastian) “In the All-Night Cafe”. What letter was hidden in Avalanche in the Belle & Sebastian treasure hunt many, many years ago and what word was it part of ? Answers should be accompanied by a convincing argument as to why the answer is correct. Some may say this favours the older, Edinburgh based Belle & Sebastian fan so here are two easier questions. Answer both for a chance to win the signed book and of course the winners bag of goodies should nobody come up with a valid answer for the letter and word. 1. Where did Belle & Sebastian get their name from ? 2. Which of the band’s albums is Avalanche’s best selling album of all time from a Scottish band ?